Leaf peeping in the Rocky Mountains is nearing it’s end due to the chillier weather and snow in the forecast for Summit County. What? Yes… we aren’t lying. However, there’s plenty still to do during this time of year. Here’s a list of the top 7 events and activities that are going in Colorado in October. Beginning on Friday October 19th, Breckenridge will host plenty of ghost and mine tours, plus other historical tours of Breckenridge and Saloon tours. At the Breckenridge Distillery, there will be an open house from 4:00 – 6:00 PM and then at 6:30 PM enjoy a multi-course meal with delicious beverage and spirit pairings. Saturday’s main event is the Still on the Hill Grand Tasting from 4:00 – 7:00 PM. Try creations from 40 different distillers and enjoy live music by the Bourbon Brawlers and Tejon Corner Street Thieves. Check out more about the event here. The Corn Maze at Chatfield Farms is a great place to get lost and have fun with the family. The corn maze is available Friday and Saturday from 10 AM – 6 PM and Sunday 10 AM – 5 PM throughout the month of October. Take the little ones through the mini corn maze, or take the whole family on a hayride, barrel train ride, or pony ride. The after dark corn maze is for those looking for a bit more of thrill while finding their way through with only the light of glow sticks. Grilled Cheese + Beer? We’re sold. It starts this weekend and you’ll get to indulge in sample bites of wonderful gourmet grilled cheeses from fantastic local chefs and restaurants. As if that’s not good enough, sample different beers from breweries across the state. Pro tip: if you purchase a VIP ticket you get to enter an hour earlier and enjoy an open bar. Head to Denver this weekend! This is a great event that incorporates a mixture of lumberjack and highland games in Avon, Colorado. The events have been adjusted for all strength and ability levels. 100% of the event proceeds go to the First Descents a local charity. This year they ramped up the event with new events, prizes and concerts featuring The Drunken Hearts and Rebirth Brass Band. Competing costs $85 and if you would just like to spectate they are asking for a $5 donation. Learn more here. This unique fall festival is held in Aurora, CO on October 6th and 7th. In its 19th year, it is Aurora’s signature fall festival and competition. Folks come from all over to see and participate in creating contraptions to launch, shoot, or fling pumpkins from 100 feet to a mile. This festival has music, food trucks, local breweries, face painting, pony rides, petting zoo, pumpkin carving, and a pumpkin patch plus so much more. Yes, there are still some great outdoor activities to partake in this October. 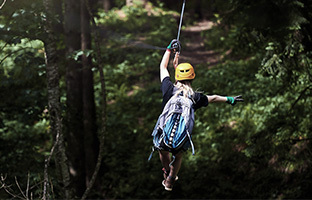 Try out a zipline tour just west of the Denver area and fly through the fall foliaged treetops with incredible views of the Continental Divide. If you want an even more unique adventure, book a starlight zipline tour and soar under the sparkling Milky Way in Colorado’s night sky. It is Colorado’s first and longest-running horror film festival. The festival features over 20 feature films, many that are being shown for the first time in the U.S., and more than 50 short films, special programs, guests and events. For those of you that love film and horror – this is a festival you don’t want to miss. With all of these great options for events and activities in October, be sure to check out www.coloradorafting.net for more information about Colorado adventures.